Yet another reminder that this blog is just a collection of my wandering thoughts on the game. So, if you would like a complete recap, head on over to BostonLax.Net. Or, if you would like to hear from both sides about the Wounded Warrior Project fundraiser that took place at the game, head to ESPN Boston for that story. 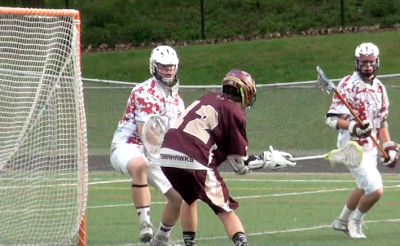 With Wednesday's 7-6 win over Westboro, Algonquin completed a third consecutive perfect season in the league. The T-Hawks haven't lost a league game since they fell at Shrewsbury in overtime 5-4. That was three years and 10 days ago on May 13th 2010. As the T-Hawks found out this season, streaks end. 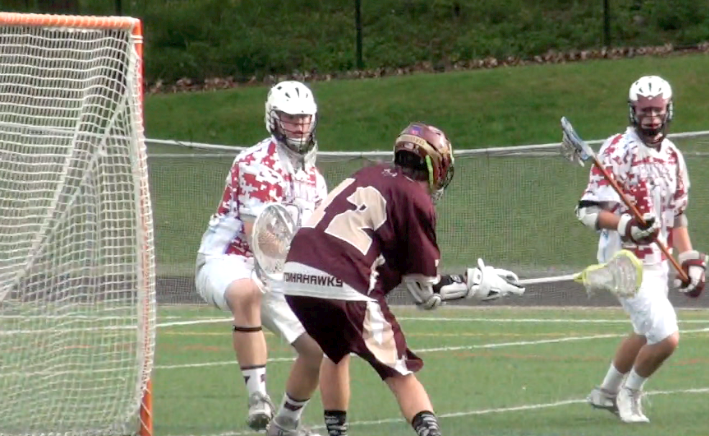 Algonquin's 37-game winning streak against Central Mass opponents was snapped by Grafton two weeks ago, and Longmeadow snapped Gonk's 21-game home winning streak in late April. But, to keep this league winning streak alive is something the program can really hang its hat on. While his team has fallen on some hard times in recent weeks, Westboro coach Tom Baker liked what he saw against Algonquin. After giving up 17 goals to Grafton, the Rangers seemed to be back to playing sound defense and possessing the ball. They did let the T-Hawks go on a three-goal run, but senior Tony Cibelli responded with a quick pair of goals, and Mike Gallo bombed in an equalizer with seven minutes to play. Baker said after the game that nobody will want to see his team in the playoffs. After playing St. John's tight and Algonquin to the wire twice, you can see why he has such confidence in his guys. We already know how great Keegan Gillis is, but junior Mike Wood and senior Jake Scearbo have really come alive the past few games, and both have done it with relentless effort. Both have been high-energy players, with Scearbo cranking up his dodging game, and Wood doing a little bit of everything. Add in the fact that Scott Perreault has come on strong in the midfield, and you suddenly have a potent and varied Tomahawk attack. Longstick middies don't get a ton of attention, but senior Mike Halloran made a pair of game-changing plays, and was solid defensively all game long. With the T-Hawks up 5-3, Halloran scooped up a ground ball around midfield and charged hard toward Westboro goalie Dan Terry. Rather than shooting himself, Halloran made the unselfish play, dishing the ball to sophomore Tyler Hatton who was following behind. It was a textbook transition goal, but not even the biggest play Halloran made. With under 30 seconds left in the game, Halloran won a tough ground ball and hurled it down field to Wood. The T-Hawks would then run out the clock and survive their trip to Westboro.